We do a lot of white kitchens. And I’m okay with that. Because they’re classic and beautiful; light and bright. And I’ll never tire of them. But I’m okay with black, too. Because in all the same ways that white is enduring and lovely, so is black. But it’s also deep and moody. It’s bold, yet classy. So when, at the very first meeting, our clients told us they were dead-set on black kitchen cabinets, we were happy to acquiesce. A quintessential 1930s Brookside home, the kitchen was painfully small and choppy. Positioned along the back of the house, it opened to a just-as-painfully-small breakfast room. 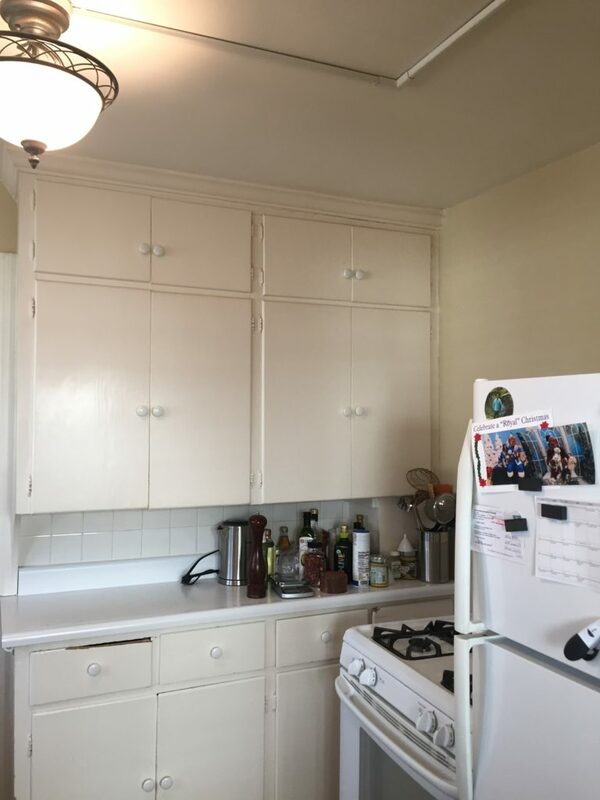 With cabinets that no longer stayed shut, a stove that sat smack dab in front of a stack of drawers and doors, preventing them from being accessed, and scarce enough countertops to do any real food prep, the kitchen was an obvious candidate for an overhaul. 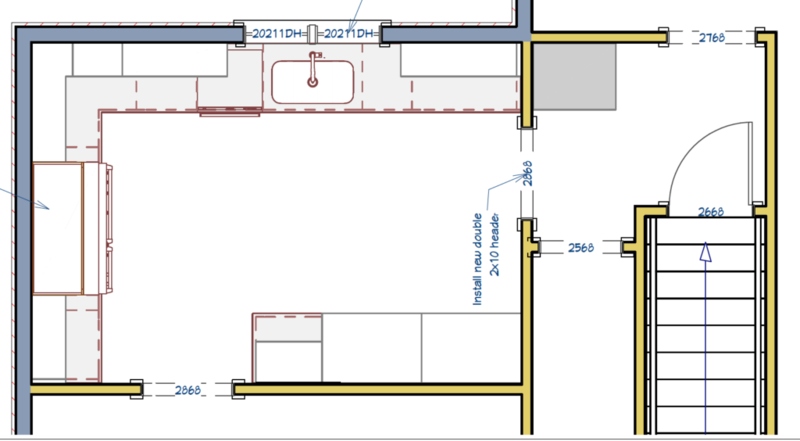 We set about to open the space as much as possible, all the while trying to avoid cost-prohibitive structural changes. The wall between the breakfast room and kitchen was a no-brainer to land on our demolition list. What wasn’t quite as easy a conclusion to arrive at was the removal of a couple windows. While the natural light was wonderful, the view was invasive of their neighbor’s patio and the tall windows prevented the walls from receiving any much-needed kitchen cabinetry and countertops. 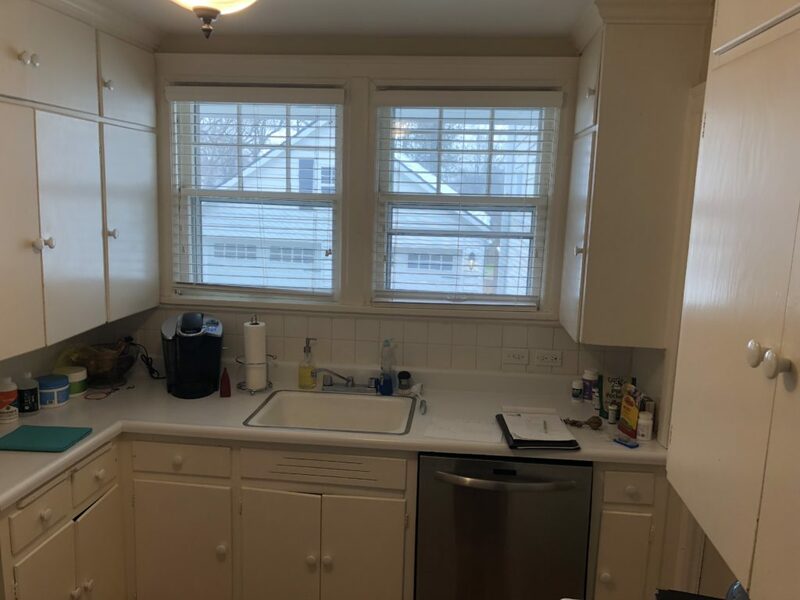 But as a consolation for losing a couple windows, we installed a pair of great new double hung windows over the kitchen sink. 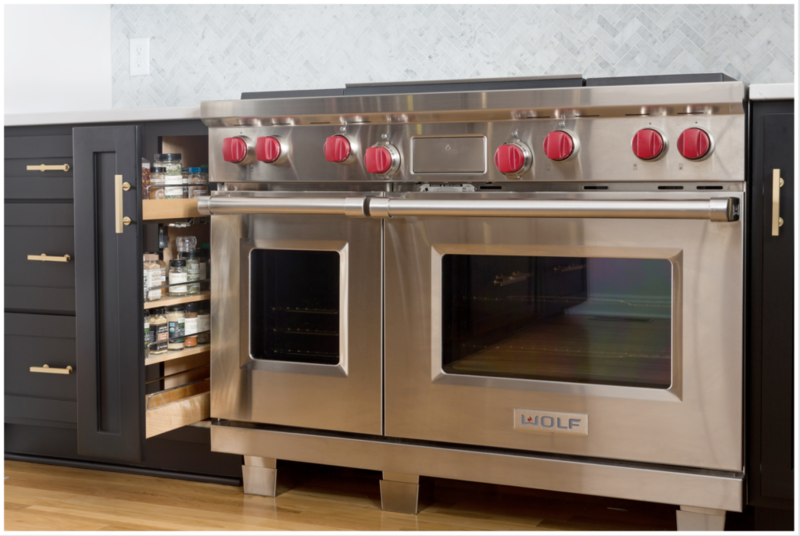 The new plan, chock full of that bold black cabinetry, accommodated the number one priority on our clients’ list: a 48 inch Wolf range. There was no messing around here! When a client is a serious cook, appliances are not to be fooled with! 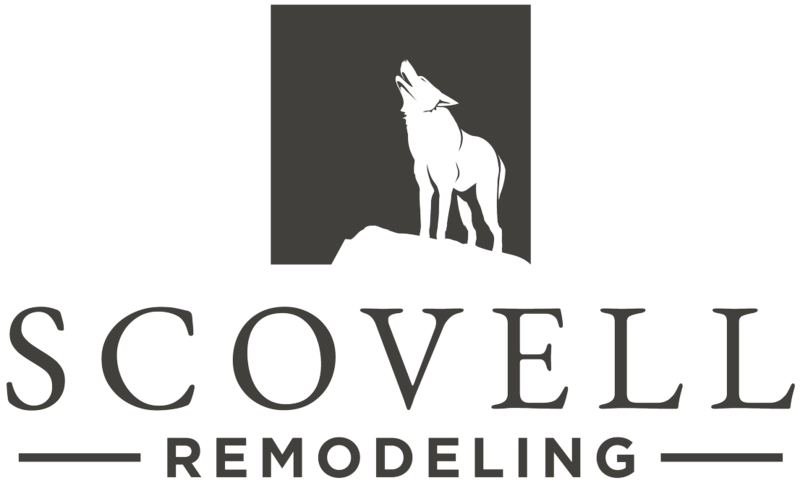 The homeowners chose a beautiful natural marble herringbone for the backsplash, and opted for a hard-working, hard-wearing Cambria quartz for the tops themselves. Brass hardware adorns the doors and drawers and coordinating brass sconces from Circa Lighting shine down over the sink. 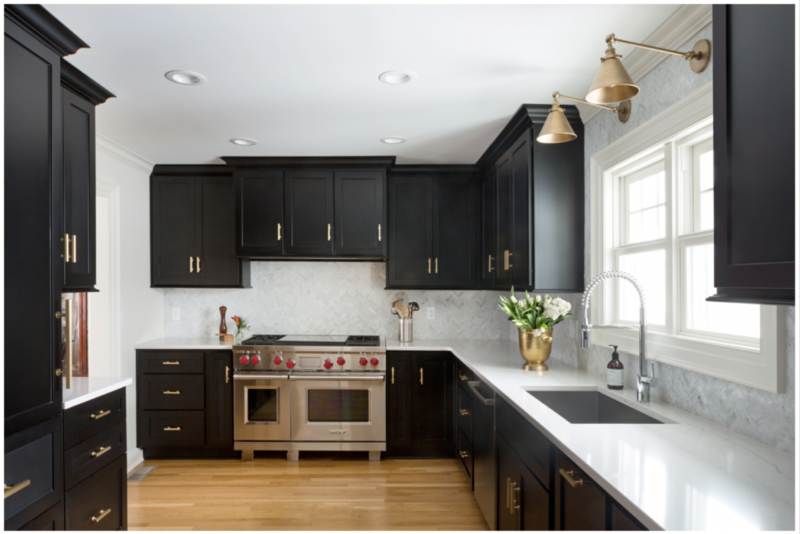 This kitchen was not without its hiccups – namely, a maddening journey to finally get the right shade of black. But the end result is really stunning. 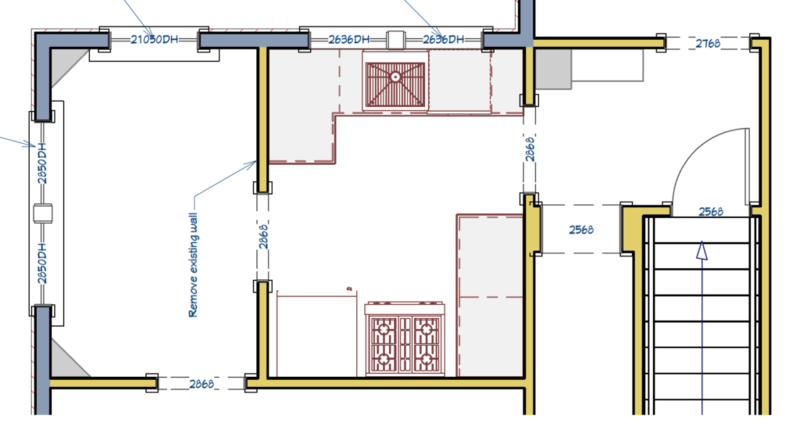 The square footage that was once chopped, sliced and diced by walls, windows and awkwardly-placed doorways is now completely maximized and practical.